Located outside Oslo Central Station, this visitor centre has plenty of staff ready to help with queries, offer suggestions and take care of bookings. They can also aid tourists with hotels, transport and tours, and have plenty of free maps and leaflets to dispense. The Oslo Pass (www.visitoslo.com/en/bookonline/oslopass) is good value for tourists, giving free admission to 30 museums and attractions. The pass also offers unlimited local travel on all forms of transport (including the ferries plying the waters between the city and the islands of the Oslofjord), free entrance to Tøyenbadet and Frognerbadet swimming pools and free parking in the municipal car parks. It also gives price reductions on sightseeing trips and numerous other discounts for cinemas, restaurants, car hire and souvenir shops. You can buy cards for one, two or three days (concessions are available) online, at the tourist information office, hotels and Narvesen newsagents. This museum dedicated to Norway’s most famous painter, Edvard Munch, still has some real gems. Highlights include two versions of The Scream, Summer Night/The Voice and his 1902 Madonna. The museum also hosts an ever-changing roster of exhibitions giving an insight into different aspects of Munch’s oeuvre. Telephone: +47 2 349 3500. Mon-Sun 1000-1700 (May-Sep); Mon-Sun 1000-1600 (Oct-Apr). Unusual, unique and occasionally spooky, the Vigeland Sculpture Park is home to over 200 bronze, granite and cast iron creations by the 20th-century artist Gustav Vigeland. The sculptor was also responsible for the design of the park itself, and thanks to its large acreage, it never feels crowded here. Telephone: +47 2 349 3700. Built in 1299 by King Haakon V Magnusson, the ancient walls and medieval tower of this imposing fortress still dominate the seafront. Renovated in the 17th century, it has magnificent banqueting halls and reception rooms alongside dank medieval dungeons. The Norges Hjemmefrontmuseum (Resistance Museum) is also held here, retelling the story of Norwegian resistance under Nazi occupation. Telephone: +47 23 09 39 17. A short ferry trip from central Oslo, the peninsula of Bygdøy is home to some of the city’s best museums, including the wonderful Viking Ship Museum. Containing two of the world’s best-preserved Viking ships, as well as scores of artefacts such as tools and sledges, it offers the perfect introduction to Norway’s Dark Ages past. Telephone: +47 2 285 1900. Mon-Sun 0900-1800 (May-Sep), Mon-Sun 1000-1600 (Oct-Apr). Located on the peninsula of Bygdøy, ﻿Fram Museum tells the story of Norwegian polar exploration with a focus on three Norwegian explorers—Fridtjof Nansen, Otto Sverdrup and Roald Amundsen. Inside the museum visitors have the chance to view the exploration vessel Fram, still intact. This is the first ship that was built in Norway for polar research. Daily 1000-1700 (Jan-Apr; Oct-Dec); 1000-18000 (May and Sep); 0900-1800 (Jun-Aug). Consecrated in 1697, and restored in 1950, this magnificent cathedral is Norway’s answer to Westminster Abbey. Hugo Lous Mohr created its ceiling art between 1936 and 1950, while the stained glass windows are by sculptor Emanuel Vigeland. A number of original features remain, including the altar screen, pulpit and font. Telephone: +47 2 362 9010. TusenFryd is Norway’s biggest theme park and is home to 30 rides, among them SuperSplash, one of the steepest water rides in Europe, and SpeedMonster, which propels riders from 0 to 90 kmph (56 mph) in less than two seconds. The Barana Fryd area keeps children occupied, while the water park comes into its own in summer. Daily 1030/1100-early evening (late Apr-late September); closing times vary, so check website prior to visit. Oslo Opera House is one of Norway's biggest cultural institutions. 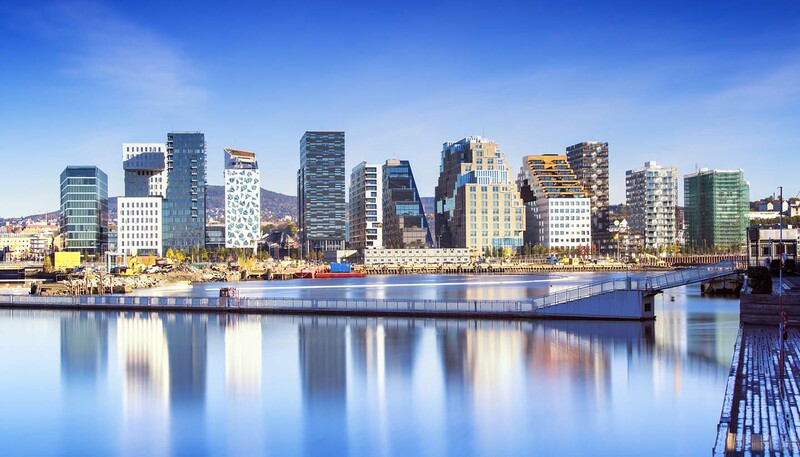 With a spectacular fjord-side setting, the futuristic ice-white building plays host to an ever-changing programme of shows, including opera and ballet plus plays and modern music concerts. Pre-booked guided tours are available all year round. Telephone: +47 21 42 21 21. Show times vary. Mon-Fri and Sun 1300, Sat 1200 (Sep-Apr) (guided tours). No (charge for performances and tours). Norway's National Gallery houses a respectable pre-1945 international art collection, with works by Gauguin, Picasso, Cezanne and El Greco. But it is the Norwegian collection that is the main draw here, thanks largely to the huge collection of work by local artist Edvard Munch, including a version of Skrik (The Scream). Telephone: +47 2 198 2000. Tue-Wed 1000-1800, Thu 1000-1900, Fri 1000-1800, Sat-Sun 1100-1700. Opened in 1950 as part of the city's 900th anniversary, Oslo City Hall is a dominant, although not especially pretty, part of the capital’s skyline. 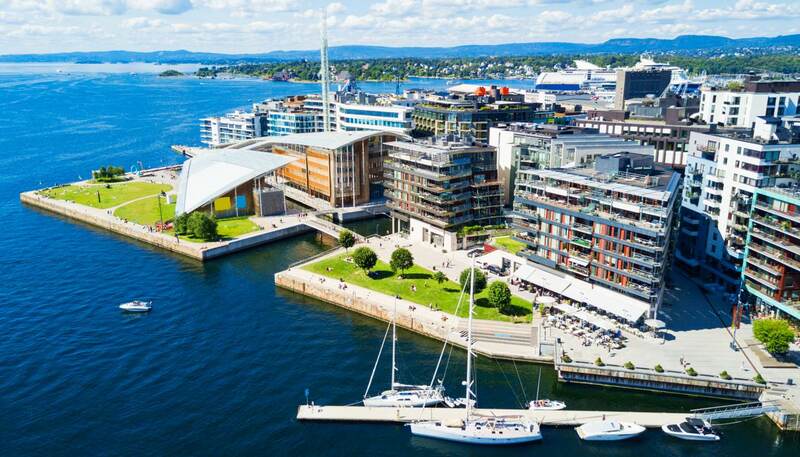 Perched on the waterfront overlooking the fjord, the twin-towered building is better inside than out with colourful frescos and murals redeeming the staid exterior. It also hosts the annual Nobel Peace Prize ceremony. Mon-Sun 0900-1800 (Jul-Aug), Mon-Sun 0900-1600 (Sep-Jun). Next to the wonderful Vigeland Sculpture Park, the open-air swimming pool complex of Frognerbadet is one of the most popular summer spots in the city. With three open-air pools, including a diving pool, water slides and separate adult and children sections, the entire city seemingly packs into the complex on sunny weekends. Telephone: +47 2 327 5450. Mon-Fri 0700-1930, Sat-Sun 1000-1800 (mid-May-Aug).